NOTE: This page is for purchasing an advanced share in the 2019 Ginger Harvest, which begins in September 2019. Community Supported Agriculture (CSA) is a community of individuals who pledge support to a local farm by purchasing farm shares. CSA Share funds collected in advance cover anticipated costs of a farm's operation, including supplies, equipment, and labor. In return, members enjoy a share of the farm�s products, as well as the satisfaction of knowing and supporting the people who grow their plants, food and create farm products. What is the "Ginger Edition"? When you a Windcrest Farm Ginger CSA Share, you are purchasing a one pound share in our 2018 fresh baby ginger harvest. Harvest begins in September 2019. Now is the time of year when we purchase the premium certified organic, certified disease-free seed for next year's crop. By purchasing a share, you are helping us cover the early production costs of this unique product. In return for your support, you will receive 1-1/2 lbs of ginger in September for every 1 lb. share you purchase now! That's a 50% return on your investment! In addition, you will receive first notice of our harvest date and priority on delivery. That means that when you purchase a 1 lb. harvest share of ginger for $16, you get 1-1/2 lbs of ginger - a $24 value! You save $8! Note: CSA Shares are limited to 3 shares per person. This will be our ninth year growing fresh baby ginger and each year we sell out quickly. Here's your opportunity to be at the top of the list for our 2018 fresh baby ginger harvest. Windcrest Farm Ginger in the NEWS! What is Windcrest Farm Fresh Baby Ginger and how is it different from the ginger I see in the store? "Baby" ginger is harvested before the rhizomes form the tough brown skin of mature ginger (the ginger you find in the grocery stores). Baby ginger is pearl white and the freshest ginger still has the stalk and leaves attached. Many people don't recognize fresh baby ginger because it is a rare sight! The taste of baby ginger is milder than mature ginger's aromatic, pungent and hot flavor. It is a uniquely local product. Windcrest Farm Baby Ginger is fresh, local and USDA Certified Organic and not imported from overseas. I bought the fresh ginger with the stalks and leaves still attached. Can I use them? Yes, use the very aromatic leaves in tea (fresh or dried) and use the stalks to flavor the cooking liquid for rice, pasta, quinoa, and soups. Cut the stalks into 2" to 3" pieces and use fresh or freeze for later use. Be sure to remove the stalks before serving your dish (just as you would remove a bay leaf used for seasoning). How long will baby ginger be available? Our ginger harvest begins	in late September. Historically, our harvest continues through early-November. Do I have to peel my baby ginger before using it? No need to peel your fresh ginger as you would mature ginger. Simply use a wet paper towel and gently wipe the rhizomes to remove any scales (shown on the left-hand side) and/or soil. How do I store fresh ginger? Fresh ginger can be stored at room temperature for up to two weeks and in the crisper section of your refrigerator for up to three weeks. 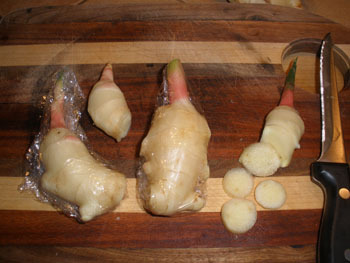 Storing it in a bag or container will keep the ginger from forming a slight skin. Once refrigerated, keep ginger in cold storage or it will become "limp". Even if it loses some crispness, it is still quite usable and delicious. We recommend freezing your ginger to preserve it for up to a year. How do I freeze fresh ginger? Fresh ginger can be frozen, stored for up to a year and used when needed, right from the freezer. Freeze minced or thinly sliced ginger in individual portions or in bulk. Freeze an entire rhizome, grate what you need and return the frozen piece to the freezer. An alternative to freezing whole pieces of the ginger rhizome is to puree the tender ginger in a food processor and freeze the puree in ice cube trays. The cubes can be thawed in a refrigerated container and used within a week. It is very important to return unused frozen ginger to the freezer immediately or it will become "mushy". If you forget to put it back in the freezer and end up with watery, mushy ginger rhizomes, place them in a food processor or blender and puree. Store the puree in the refrigerator for up to three weeks or dehydrate it to use as a ginger powder. Can I plant the baby ginger rhizomes to grow my own ginger? No, this ginger has been harvested before it has matured enough to be used as seed. Are "seeds" or plants available? Seed rhizomes are available in later winter/early spring. Because ginger is a tropical plant with a long growing season, ginger seed rhizomes must be "pre-sprouted" in a very warm (70-80 degrees) greenhouse chamber in late February for harvest in late September/October. When the soil temperature reaches a constant 55 degrees, ginger is transplanted into the ground under a greenhouse covering. Ginger plants require frequent, high nutrient feeding, consistent watering and have little tolerance for weeds. Windcrest Farm will have pre-sprouted ginger seed available for sale in late Spring 2016 and ginger plants available in May. Ginger contains very potent anti-inflammatory compounds called gingerols. Gingerols, have been shown to inhibit the growth of cancer cells as well as being an effective pain reliever for arthritis sufferers. Ginger has a long history of being very effective at alleviating gastrointestinal distress and motion sickness, especially seasickness. In one study, ginger was shown to be far superior to Dramamine, a commonly used over-the-counter and prescription drug for motion sickness. Ginger reduces all symptoms associated with motion sickness including dizziness, nausea, vomiting, and cold sweating. Ginger's anti-vomiting action has been shown to be very useful in reducing nausea and vomiting of pregnancy. Unlike anti-vomiting drugs, which can cause severe birth defects, ginger is extremely safe, and only a small dose is required. Ginger is so concentrated with active substances, you need very little to receive its beneficial effects. For nausea, make a ginger tea by steeping one or two 1/2-inch slices (one 1/2-inch slice equals 2/3 of an ounce) of fresh ginger in a cup of hot water. For arthritis, some people have found relief consuming as little as a 1/4-inch slice of fresh ginger cooked in food. What are some ways I can use fresh ginger? We love to add ginger to green and fruit smoothies. Slice and freeze the rhizomes in smoothie-sized pieces for use throughout the year. Ginger Leaf Tea: To prepare leaves to store for tea, cut off the stalks approximately 2 inches above the ginger root. Pull off leaves and rinse, blot dry, then cut into small pieces. Place the cut leaf pieces on a paper towel to air dry on the counter. When thoroughly dried, store the ginger leaves in a glass jar or zip-lock bag. Ginger Root Tea: Using a carrot peeler or knife, cut two slices of ginger root approximately 1 to 2 inches long. Boil four cups of water, add the ginger root slices and let simmer for 15 minutes.Strain out the ginger slices before drinking. Our USDA Certified Baby Ginger Harvest begins in September 2019. Purchase your Ginger CSA Share now and receive 1/2 lb of ginger FREE with your Share in September 2019.